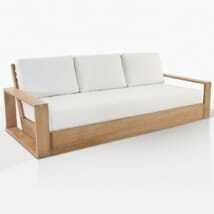 This teak outdoor coffee table combines various beloved styles into a single piece with immense presence. 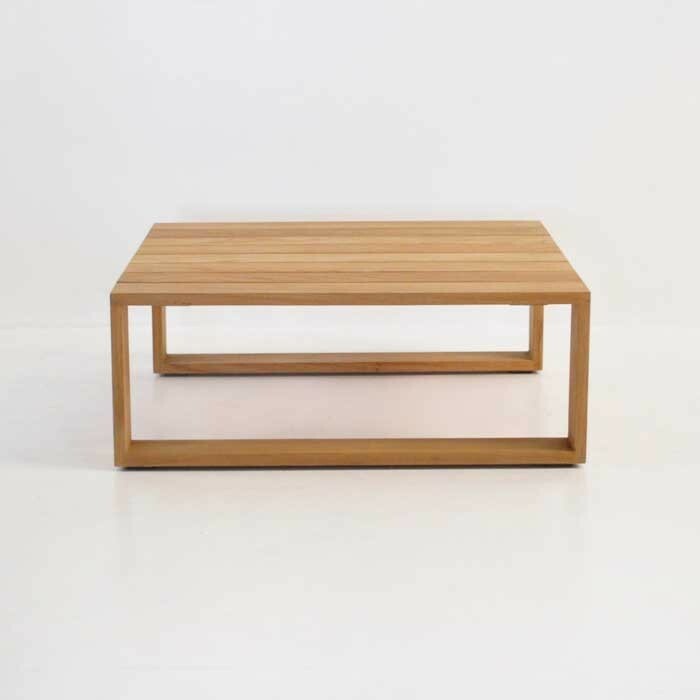 Mid century modern meets with contemporary and comes together with old world techniques to create a very slim, very open teak outdoor coffee table. It’s got definite modern attributes, with a here-and-now attitude. 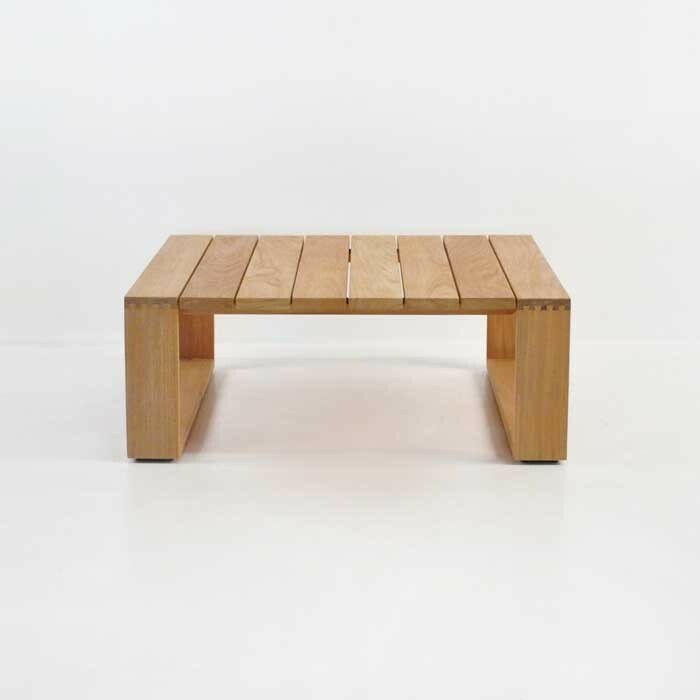 The warmth of the A-Grade teak combines with old world craftsmanship (in the form of exposed dovetail joinery) to make a really interesting outdoor coffee table. 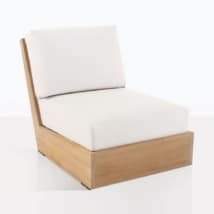 W37" x L37" x H14"
The rectangle leg architecture matches that of the Kuba collection’s other pieces. 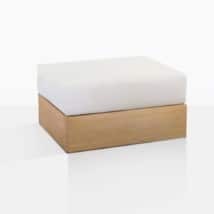 This denotes the organic and yet futuristic feel of many of the best mid century modern pieces, which could be said to have inspired this teak coffee table. 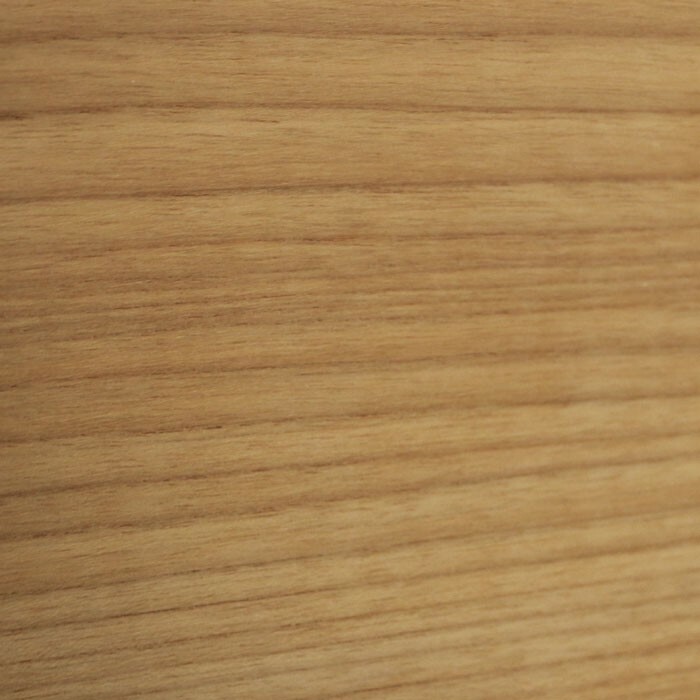 The minimalist look to the table top keeps the 37” by 37” surface flat and clean looking, by highlighting the slight spacing between teak boards. The floating feel of the other Kuba pieces is carried through with this teak coffee table as well, so the possibilities are endless with flooring (indoors) or natural ground cover outdoors. That’s another highlight of the Kuba collection, and especially this table: the feel can be bold outside or inside. 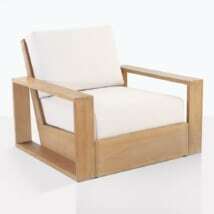 The clean, finished qualities of the pieces really allow a lot of variation and flexibility for the pieces. 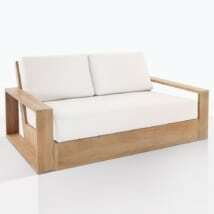 The design of this outdoor coffee table is simple, but striking. The clean edges are tailored to provide smoothness, but as you look at it, the edges are crisp and defined. His table fits so well with so many modern influenced pieces and works incredibly well with metal furniture around as well. Raw concrete is another contrasting finish that makes sense with the profile and color palette of this table. The clean design and the warm color of the teak make this teak outdoor coffee table one that will work with so many other pieces. 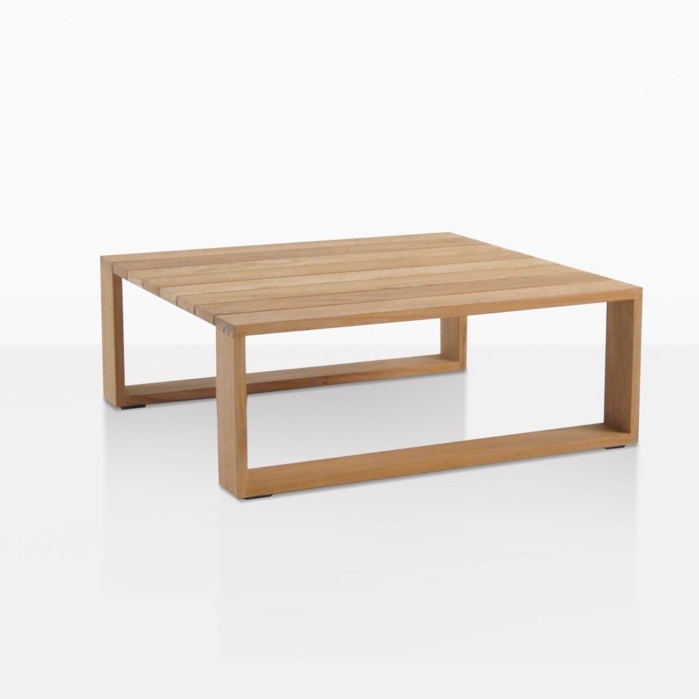 If you’ve got an eclectic mix of furniture currently and want a piece that can either be bold, or take a back seat to more substantial pieces, you might be looking for this teak coffee table.